Welcome to White Pine Island! Just a few miles off the coast of Georgia, this island is accessible only by boat, plane, and your imagination. Many residents call the island home year-round, but day visitors and tourists bring plenty of excitement with them. Like other resort islands, there are quaint shops, cool restaurants, and friendly bars. There are several resorts on the island, but the queen of them all is the elegant Grand Hotel on a bluff with an ocean view. Owned by the extensive, multi-generational Phillips family, the Grand Hotel offers elegant service, five course dinners, and plenty of romance. Bethany Hinkle arrives at White Pine Island’s Grand Hotel for her sister’s wedding and to do a little environmental snooping. She snaps pictures of the hotel’s pristine golf course to ensure its compliance with EPA standards. Soon, she realizes that the course’s manager is as attractive as the course he so carefully protects. Ned Phillips feels the weight of family expectations squarely on his broad shoulders. The Phillips Family has owned and operated the Grand Hotel for three generations. For now, he manages the hotel’s golf course and makes plans for its future—plans that could be destroyed by Bethany’s spying. He gets close to the lovely environmentalist to watch for her next move until he gets too close to let her go. What happens when you fall in love with your best friend just when it’s too late? 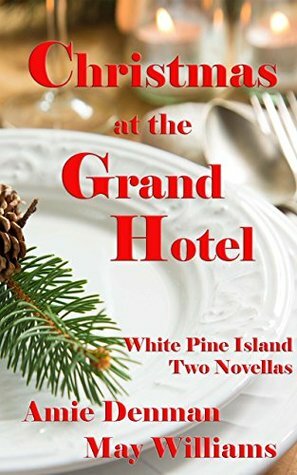 All her life, Ellen Phillips has loved working for her family’s Grand Hotel on White Pine Island. Flying the hotel’s airplane and piloting the island ferryboat while knowing someday she will inherit the luxurious resort is a fairy tale existence she has no desire to change. She’s always loved Pete McCormack, too. After all, he’s her best friend, confidante, and playmate. Until she suddenly sees him in a different light just before Christmas. Pete McCormack has made sacrifices for his family’s golf cart rental business on the island, choosing to stay home and run it instead of pursuing his dream of his own career on the mainland. When his parents announce their plans to sell the business so Pete can leave the island, he has to choose between the future he thought he always wanted and his newfound love for the woman he would be leaving behind. May Williams is convinced that she read every book in the public library of her hometown as a kid. Today, her house sags under the weight of books. If she’s not reading or writing, May can be found pursuing her other two passions – sewing and running. 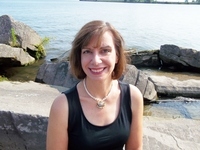 May lives happily in a little town on the shores of Lake Erie with her husband, two children, three cats, and one oversized dog. The atmosphere of a beautiful hotel during the Christmas season always enchants me. When Amie and I began planning the White Pine Island series, we immediately agreed on Christmas as the setting for the first novellas. Since we both travel whenever the opportunity arises (these books were born on a train ride home from Chicago), we imagined gracious and lovely places infused with holiday décor. Elaborately decorated trees, twinkling lights and glowing candles, the scents of pine and cinnamon, and holiday music in the background soon came to life. We wanted the Grand Hotel’s lobby and ballroom to invoke an equal share of glamour and ease. A place where families and friends could reunite and lovers steal private moments amongst the splendor of holly and mistletoe. 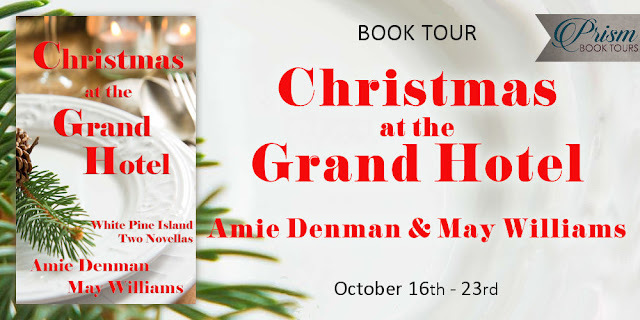 In Ellen and Pete’s story, the Phillips family who own the Grand Hotel, host a Christmas Party for the year-round residents of the island. Such an event calls for a spectacular tree to preside over a fun event. The locals know a thing or two about enjoying life since they do live in a place dedicated to tourism. The hotel’s ballroom hosts special events year round, but the Christmas event stands out as the one that all of White Pine Island can enjoy. In both stories, the couples spend plenty of time outside the hotel as well. Since we created White Pine Island to be off the coast of Georgia where the December temperatures are mild, we took the beauty of the season to the hotel’s front porch. You’ll find our characters lounging on wicker settees or relaxing in rocking chairs by the soft glow of Christmas lights as they converse on the porch. A little southern charm, a dash of holiday cheer, and couples newly in love intertwined—what could be more perfect for the holiday season! Thanks for hosting Christmas at the Grand Hotel today. Amie and I had fun writing the stories, and we hope readers enjoy the holiday theme. The cover and the synopsis convinced me to put in my reservation for the Grand Hotel! Happy book tour!! I think that the cover art is most excellent. I would like to give thanks for all your really great writings. I wish the best in keeping up the good work in the future.